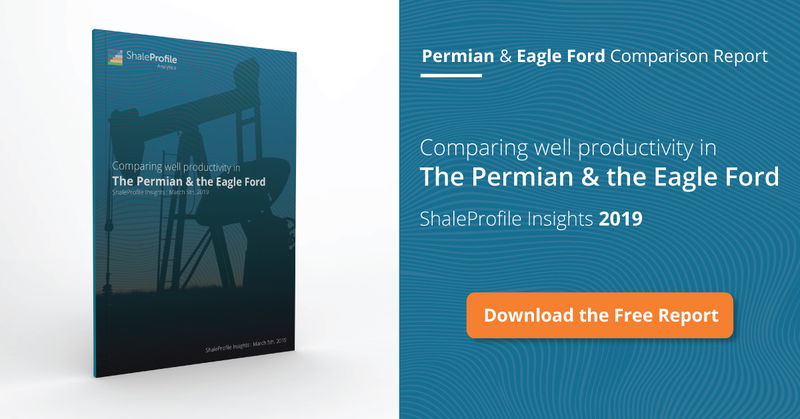 This interactive presentation contains the latest oil & gas production data through April from all 15,532 horizontal wells in the Permian (Texas & New Mexico) that started producing since 2008/2009. The graph above shows the rapid growth of unconventional oil production from horizontal wells in the Permian where total oil output doubled in the past 2 years. As usual for this region, recent data is incomplete, and I expect that after revisions April production has set another record to over 2.2 million bo/d. In the “well quality” tab the production profiles for all these wells can be analyzed. The bottom graph shows that average well performance strongly increased from 2013 to 2016, and has not much changed since then. The 3 leading operators, Pioneer, Concho and EOG, have more than tripled their operated production in the past 4 years (see the ‘top operators’ overview). Here you can see that recent wells track quite closely the performance of the wells that started in Q2 2016 (the light green curve), which have in 2 years recovered on average 180 thousand barrels of oil and are now at a production rate of 132 bo/d. The graph in the 5th tab (‘Productivity over time’) displays how well productivity, as measured by the average cumulative production in the first 2 years, has evolved over time. You’ll note that this metric almost tripled from 2013 to 2016, to more than 180 thousand barrels of oil. The next update will be on the Eagle Ford, followed by a post on all 10 covered states in the US. Within the next week we are launching here our new online analytics service, with which the data and trends for more than 100 thousand horizontal wells in the US can be analyzed in user-friendly dashboards. Enno, I like the new format. I’m proud of what you’ve done with shaleprofile.com. That’s great to hear Mike, thank you! There has been some discussion elsewhere on the concept of the bubble point of death. If there are any petroleum engineers or geophysicists familiar with this concept, does anyone see evidence of this by looking at the Permian data? Seems like GOR has been pretty steady at about 3 to 3.5 in the Permian and in the Eagle Ford it runs around 6 basin wide. Maybe when the Permian wells get to about a GOR of 5 to 6 the decline rate seems to increase. Is there some rule of thumb, or does this vary quite a bit well to well depending on the characteristics of the rock that surrounds the well?